This set of knives does triple duty, enabling you to get the job done three times faster. 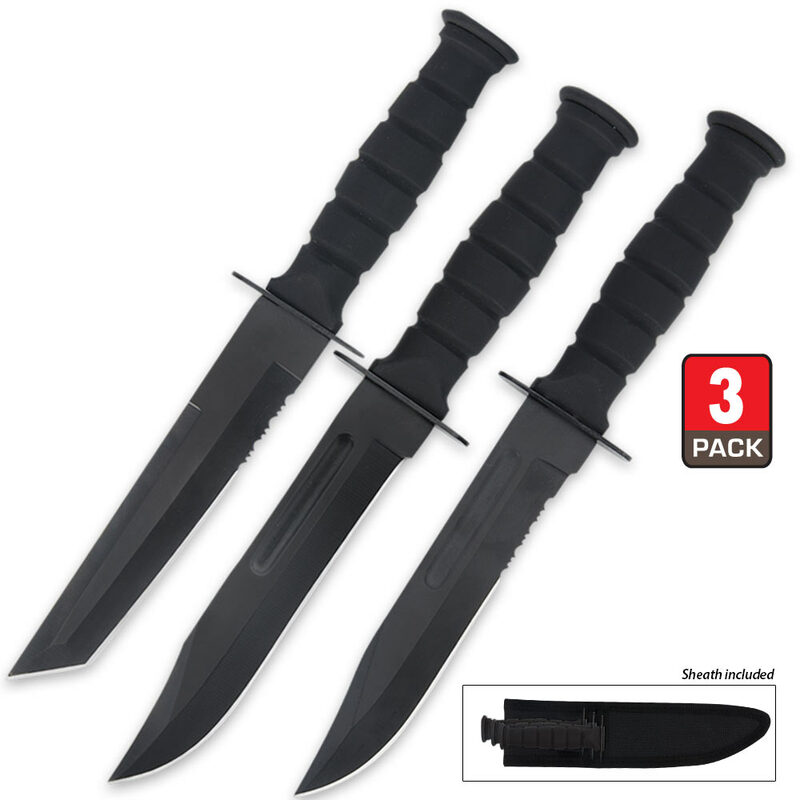 This three-piece survival knife set includes a serrated tanto point knife, a plain-edge clip point blade and a serrated clip point fixed-blade knife. Each one features a stacked-style rubberized handle for a non-slip grip and stainless steel blade for strong performance. These knives are great for a great price, and they are worth it?? These are very small and i had read the other review so i knew they would be but let me tell you these are so cute now i bought these to put in various medical and survival/bug out kits. I have a dedicated Fixed blade knife that is full tang carbon steel, that is my actual knife thats the working knife i bought these ONLY for cutting. any knife shouldnt be used for batoning chopping and rough carving unless you have nothing else. that being said these arent full tang i dont know the quality of the steel and they are small which makes them perfect for survival cooking and cutting and make nice back pack or stocking stuffers. need a chopper buy an axe, need a cute cutter buy these guys. Several reviewers have reported surprise at the diminutive size but they were what I expected and wanted, primarily as a belt knife while canoeing. The handles are okay for my medium size glove hands. They arrived sharp enough to cut me - not the blades, the manufacturing burrs left on the pommels; easily corrected with a file and emery cloth. The photos and video give no evidence of scale until you look closely at the brief moment of the ubiquitous "hand cutting cords" display. But the video shows each knife in its own, snap strap sheath and the fact is captioned in large letters. A sheath is shown as an inset in the main still photo and is labeled "Sheath included for each knife." The package was delivered with ONE inexpensive nylon sheath holding all three knives in separate sleeves with the handles bunched together and secured by a velcro strap, a strap so long that it cannot be tightened enough to hold one handle in place. If you carry all three and open the retainer strap, all three handles are loose enough to fall out with very little movement. The individual blade sleeves offer no retention at all. It's a ridiculous sheath that's only useful for shipping or storing in a drawer. They are probably leftovers from a set including a knife, smaller knife and small stone. I've made a dozen or more purchases at BUDK but this will be my first contact with Customer Service. The knives are okay and suit my purpose. Here's hoping Customer Service doesn't want me to pay to return the set and replace it with three sheaths holding reject knives. good for throwing, and for concealment. Picked up 4 sets of 3 for stocking stuffers, they are small sharp and good for the price. great for a BOB , tackle box , glove box. Smaller than I had wanted but sharp as hell , small and sturdy. Great for a cub scout. I am not disappointed.